Insyirah: Jurnal Ilmu Bahasa Arab dan Studi Islam menerbitkan artikel kajian dan penelitian dalam bidang ilmu bahasa arab dan studi islam, meliputi: nahwu, sharaf, arudh, lughoh, qord, insya, khot, bayan, ma’ani, istisyqoq, badi’, qhofiyah, fikih, ilmu kalam, ilmu-ilmu Islam (tauhid, fiqah, tafsir, hadist, akhlak), ilmu fiqih islam, fiqih wanita muslimah, fiqih ibadah, fiqih shalat, fiqih nikah, fikih puasa, fiqih zakat, fiqih kurban, fiqih haji, pemahaman terkait sekularisme di barat, ekonomi islam, dan lain-lain. 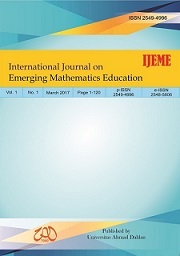 International Journal on Emerging Mathematics Education (IJEME) is a peer-reviewed open access journal published twice in a year (March and September). The IJEME aims to provide an international forum for researchers and professionals to share their ideas on all topics related to mathematics education. It publishes its issues in an online (e-ISSN 2548-5806) and a printed (p-ISSN 2549-4996) version. The IJEME has been accredited by National Journal Accreditation (ARJUNA) managed by Ministry of Research, Technology, and Higher Education, Republic Indonesia with Second Grade (Sinta 2) since Volume 1 Number 1, March 2017 to Volume 5 Number 2, September 2021 according to the decree No. 30/E/KPT/2018. This journal has been indexed and abstracted in SINTA, DOAJ, Garuda (Garba Rujukan Digital), Google Scholar, Crossref, BASE (Bielefeld Academic Search Engine), Microsoft Academic Search, and CiteFactor. The IJEME welcomes high-quality manuscripts resulted from a research project in the scope of mathematics education, which includes, but is not limited to the following topics: Realistic Mathematics Education, Design/Development Research in Mathematics Education, PISA Task, Mathematics Ability, ICT in Mathematics Education, and Ethnomathematics. The manuscript must be original research, written in English, and not be simultaneously submitted to another journal or conference. All submitted manuscripts will be initially reviewed by editors and are then evaluated by minimum two international reviewers through the double-blind review process. This is to ensure the quality of the published manuscripts in the journal. Author has to make sure that the manuscript has been prepared using the IJEME's template following the author guidelines. The manuscript should also have been carefully proofread. Any manuscript which does not meet the author guidelines, written in a different format, or has poor soundness of English, will be immediately rejected. The only manuscript which meets the IJEME format will be processed further.